Previous recipient of the award, K.D. Wentworth (The Course of Empire, Stars Over Stars) returns to edit this top-notch anthology of this year&apos;s winners in the contest&apos;s 25th year. The collection offers a dozen strong stories that range from well-conceived fantasy to classic science fiction reworked. Standout stories include Donald Mead&apos;s touching ""The Shadow Man,"" with its lingering postwar ghosts in Hiroshima; Matthew S. Rotundo&apos;s exploration of the ethical boundaries of military intelligence in ""Gone Black""; and Jordan Lapp&apos;s portrayal of the short, fiery life of a phoenix in ""After the Final Sunset, Again."" Other featured writers such as Emery Huang, Fiona Lehn, and Mike Wood depict the rise of mega-corporations with paramilitary patent enforcers, for example; or competition for government financing turned into a dangerous sporting event; and computerized risk management taken to dangerous extremes. Each of the 12 stories is paired with the work of one of the winning illustrators from L. Ron Hubbard&apos;s companion contest. 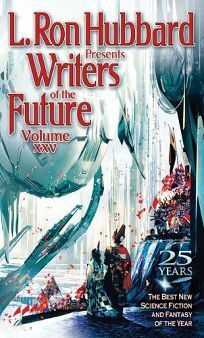 Several essays round out this volume, complimented by noted author and perennial judge Robert Silverberg&apos;s piece on the history of the contest. Always a glimpse of tomorrow&apos;s stars, this year&apos;s anthology is definitely a must-have for the genre reader.